SPERI professorial fellow Andrew Gamble and research fellow Scott Lavery contributed to the Sheffield Fabians conference on Saturday 29th April. 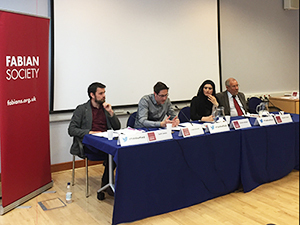 Andrew spoke on a panel alongside Lord Maurice Glasman (Labour Peer) and Paul Blomfield (Sitting MP, Sheffield Central) on Brexit and its implications. Scott spoke on a panel alongside Richard Caborn (former trade minister, adviser to Advanced Manufacturing Park) and Leigh Bramall (former Deputy Leader, Sheffield City Council) on regional economies and investment. You can listen to all of the panels at the conference here.